Ford is the first brand to take advantage of a combined offering between Primesight and RadiumOne that integrates out-of-home and mobile advertising so that advertisers can target people based on both their location and their content sharing behaviour. 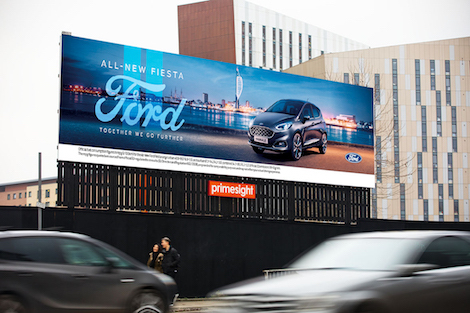 Ford is promoting its new Fiesta – the UK’s best-selling car – whereby, whenever the target audience comes within a certain distance of a Primesight billboard, RadiumOne serves a mobile display ad to those who’ve shared or engaged with content online relevant to Ford’s campaign. By combining RadiumOne’s data with that from from Route, the OOH industry audience measurement standard, allows the campaign’s reach to be extended beyond people in the vicinity of the poster. RadiumOne claims to be the only data-driven marketing company that connects the dots between brands’ paid, earned, shared and owned assets to find and connect with high-value consumers. Through their ability to see the strongest signals of consumer intent and predict where consumers are on their journeys, they say they can build brand-specific campaign strategies. Based in San Francisco, RadiumOne has offices across the US, Canada, Europe and Asia Pacific. This entry was posted on Thursday, July 27th, 2017 at 07:30 @354 and is filed under DailyDOOH Update. You can follow any responses to this entry through the RSS 2.0 feed. You can leave a response, or trackback from your own site.